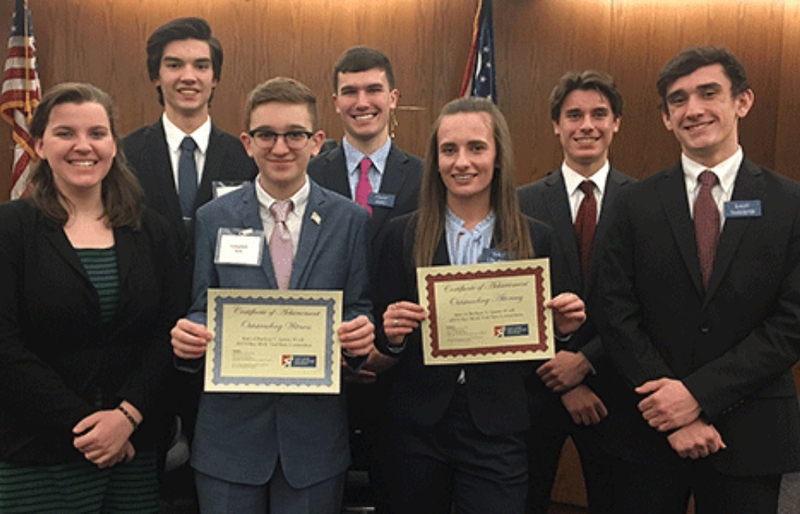 In their fourth consecutive trip to the state mock trial competition in Columbus, our Legal Lions finished among the top seven teams in Ohio in fiercely contested courtroom action. The Lions swept both trials on the tournament’s first day. The prosecution defeated Lake Ridge Academy, with junior Emily Callahan earning best attorney and sophomore Connor Marrott, best witness. The defense then beat the Cleveland School of Science and Medicine, with senior Carter Callender winning the best attorney award and senior Tommy Shero getting the judges’ nod as best witness. As a result of the first day’s victories, the Lions were among just seven unbeaten teams to qualify for the quarter-finals. In sudden-death elimination, NDCL lost to Sylvania Southview, which won the tournament in 2018 and finished as the state runner-up this year. More than 300 teams from throughout the state competed in this year’s mock trial program. Only 29 qualified to advance to Columbus. English teacher Ms. Victoria Frabotta ’86 and Social Studies Department Chairperson Mrs. Molly Schneider advise NDCL’s mock trial teams. Pictured In Cover Photo: Members of NDCL’s Legal Lions mock trial team celebrate after advancing to the quarter-finals at the Mock Trial State Tournament in Columbus last week. Team members include seniors Hannah Taylor and Tad Brennan, sophomore Connor Marrott, senior Tommy Shero, juniors Emily Callahan and Pierce Thomas, and senior Carter Callender. 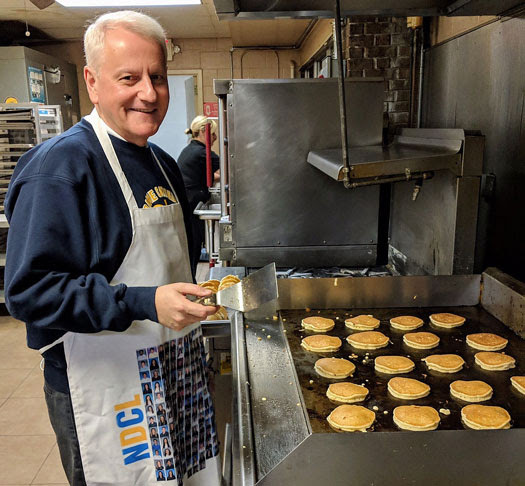 Principal Mr. Joseph A. Waler continued his tasty tradition by treating the entire junior class to a free pancake breakfast before they took the ACT exam last Tuesday. All kidding aside, Mr. Waler credits the instructional expertise of our teachers, the rigor of our curriculum, and the hard work of our students for the academic success that recently led to NDCL’s National Blue Ribbon Award. The pancakes and syrup? Well, they just remind us how sweet it is to achieve our goals!